CHANNEL ISLANDS HARBOR — Previously known as the Boating Instruction and Safety Center, the new Channel Islands Boating Center at Harbor Boulevard and Blue Fin Circle is scheduled to open in mid-February. The main focus of the boating center is to provide opportunities for ocean-based education and recreation to students of California State University, Channel Islands, Ventura County residents and visitors. “It has taken a long time to get to this stage, but the construction is nearly complete, the boat dock and gangway installed and the landscaping is nearly finished,” said Channel Islands Harbor director Lyn Krieger. The finished facility includes 26,000 square feet of exterior space with storage for small boats, a two-story 15,000-square-foot building and a one-story 1,000-square-foot maintenance building. In addition, the L-shaped dock that wraps around the neighboring Channel Islands Maritime Museum is 386 linear feet in length. There is 7,692 square feet of deck space and the public dock area measures 110 linear feet, with 1,244 square feet of deck. And, a specially designed dock attached to the main dock will facilitate the ease of getting in and out of kayaks. The entire facility is Americans with Disabilities Act-compliant. The modern building has a nautical flair and the eco-friendly landscaping doubles as a bioswale to collect all runoff. There are large classrooms, a conference room, showers and lockers. 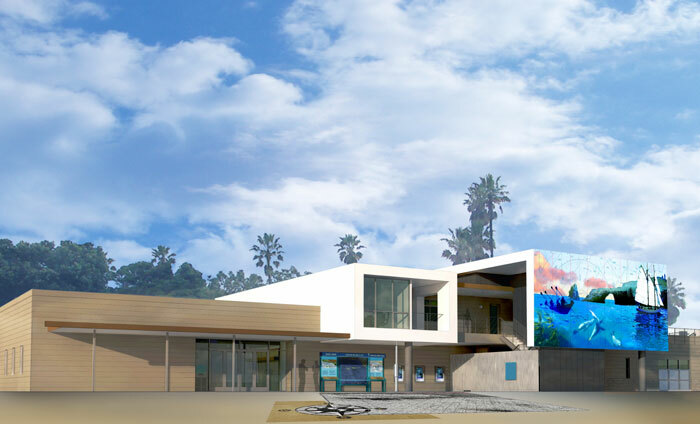 And, due to the partnership with the Channel Islands National Marine Sanctuary and their funding of $900,000, educational exhibits will be placed both inside and outside of the facility to allow visitors to learn about the natural and cultural history of the area and the Channel Islands National Park and Marine Sanctuary. Upon the center’s opening, California State University, Channel Islands will assume responsibility for the day-to-day operations. Joshua Wade, coordinator of Lifetime Leisure Programs for the university, will be in charge of operations at the new boating center — with the aid of eight student assistants to administrate and facilitate the myriad classes and programs to be offered. The center’s indoor/outdoor life-size exhibits can be enjoyed by visitors the center, and they will also be a valuable teaching tool for CSUCI students, school groups and community groups, Wade said. Pacific Corinthian Youth Foundation’s youth summer sailing program will be moving from Pacific Corinthian Yacht Club to the new facility, and Channel Islands Sailing Sports Club will also be based at the center. According to Wade, he and the university are currently talking with Channel Islands Maritime Museum to work collaboratively on a variety of programs that will be offered throughout the year to students and local residents. The nearly $6 million cost of the boating center project has been partially funded through $1.5 million raised by the Channel Islands Harbor Foundation (which continues to raise funds to support the center) and $3.5 million from the Department of Boating and Waterways, in construction financing.